By the middle of next week much of the midwest will observe highs on par with the average high temperature in mid-January! With snow cover on the ground, these temperatures could plummet even further. The snapshot on the left is the forecasted wind chills for Thursday morning! The gray area of below zero wind chills will depend on where a band of accumulating snow sets up for Monday and Tuesday, the latest on that can be found at: Winter Storm Update. Even without the snow cover, wind chills will creep around 0 degrees! The extreme cold, for November, will encompass much of the eastern half of the country with well below normal temperatures. 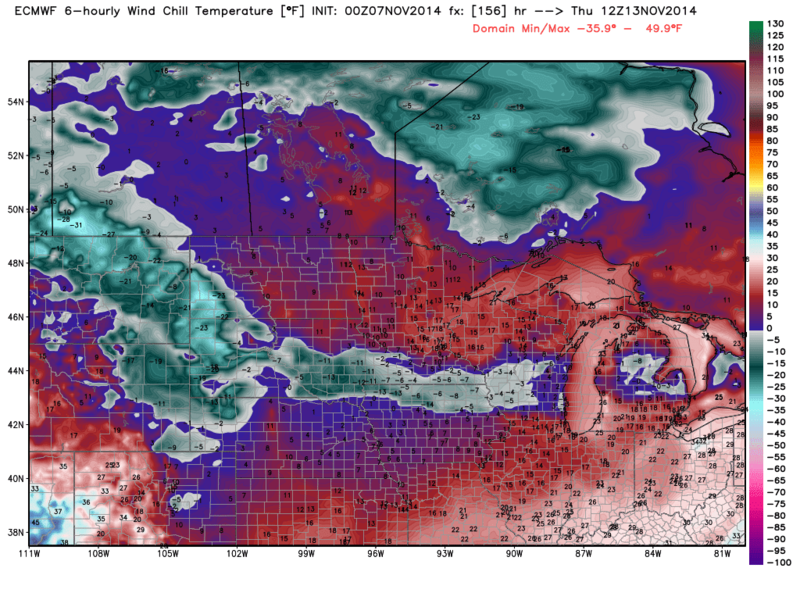 850mb temperatures are around -15C for much of the Midwest (see map for your location). Temperatures this low at 850mb would translate to high temperatures in the 20s, which appears to be the rule of thumb across much of the Midwest Thursday. Add 6" of snow and highs could be stuck in the teens for parts of the Midwest by the middle to end of next week! Wow! Some values during the afternoon may be colder than the average high temperature in January. Wednesday and Thursday appear to be the coldest days, with the brunt of the Canadian airmass centered over the Midwest. The plot on the left shows the high temperatures forecast by the 00z ECMWF run last night. 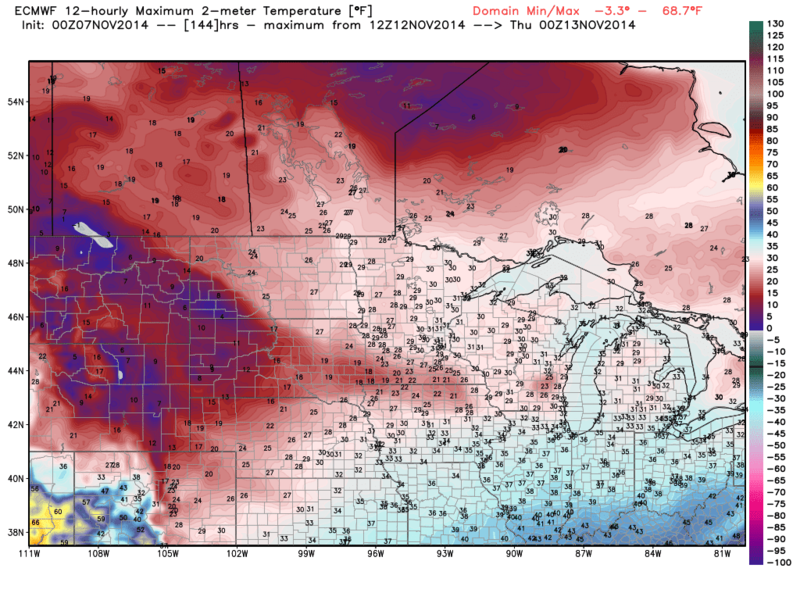 Widespread 20s are very likely, the GFS among other models are painting a similar picture across the Midwest. After a Monday into Tuesday winter storm and substantial cold, it will certainly feel like winter by this time next week, bundle up out there!